For more than 20 years Eager.one has been involved in the design of Flare Tip replacement equipment. Together with local partners (Asia, Middle East, USA and South America) Eager.one provides full scope Flare Tip replacements on- and offshore. The A-Frame is a modular construction and can be used on most flare structures also offshore even on flare booms and FPSO’s. 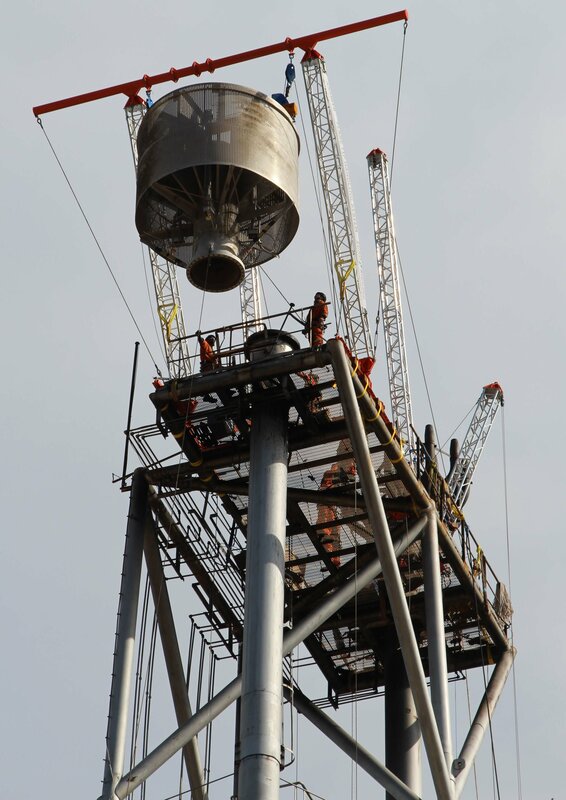 There is no need for additional cranes or helicopters, all items will be lifted to the flare top platform manual and by means of a hand carried single pole (In the picture below). Eager.one has provided method statements, equipment and for a number of cases replacement services for over 50 projects. The A-Frame can be used on existing assets but is also a great alternative for a Retractable Davit. For more information please contact us, we are Eager to support your flare tip replacement project. Bespoke sheave blocks delivered in two weeks, a mission impossible? Not for us! As an independent partner, we advise about, design and construct everything from concept study to project completed. Our in-house developed design software calculates everything concerning mobile cranes and bespoke heavy equipment, while our people offer the expertise and skills that secure your success. Our 40 years of experience provides the basis of a successful start of your project: right from the FEED phase. Preparation is vital. Therefore our concept studies, method statements and mission equipment offer you all the support you need. Our aim is to optimize your project team’s results. With our exclusive knowledge of lifting and transportation we eliminate and manage risks. This is how we reach our collective goal: Zero Accidents, Zero Incidents. We have built up a great deal of experience with the design of (mobile) cranes and bespoke heavy equipment such as piling machines and excavators. Our customer base includes the most prominent producers of cranes and heavy machinery worldwide. Call +31 (0) 30 240 80 60 or use the contact form. We always respond within 24 hours. I would like to receive news about services, products, business cases and more.